Mini rickshaw revealed! | What Car? 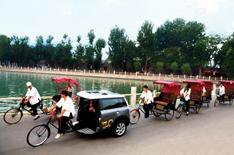 There are plenty of rumours about a 4x4 Mini derivative, but we hadn't heard about this Mini rickshaw, which has been spotted pounding the streets of Beijing since the Olympics kicked-off. Heralded as emissions-free, the rickshaw is surprise, surprise a marketing stunt to promote the Mini Clubman. In total, 2278 Minis were sold in China in the past 12 months, making it the second biggest market for the company in Asia, after Japan.